Two days later, I left town for what was the pièce de résistance of my hiking summer, a backpack trip in the Enchantments. I had applied for my sought-after permit back in February and was lucky to have the time off from school coincide with my selected dates. 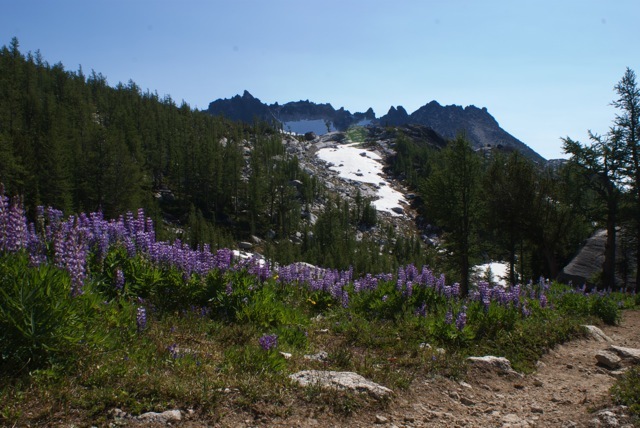 My friend and I stayed in a motel in Leavenworth's quiet part of town and were at the trailhead the next morning at 8:15, ready to hike. 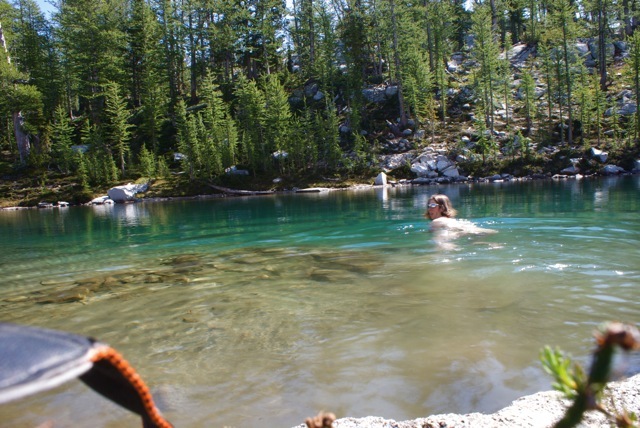 I had read dozens of reports and accounts of the hike in to Snow Lakes and all of them made the hike sound like a real grunt. My experience was pretty good compared to what I had read, though when I saw a lakeside camp with a view of Temple Mountain, I was so ready to drop my pack. 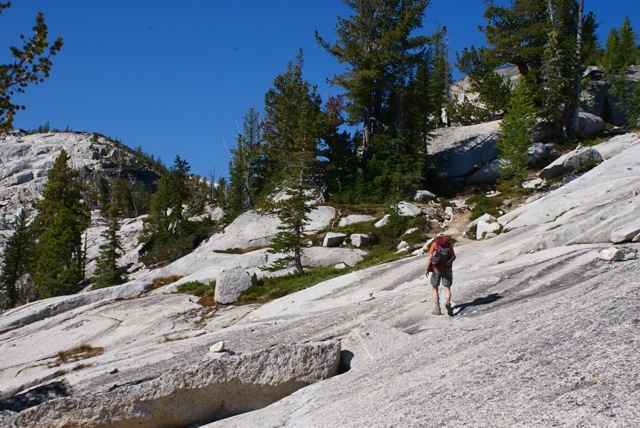 In the morning, we set off to dayhike the Basin area and were surprised at how difficult the trail was up from Snow Lake. 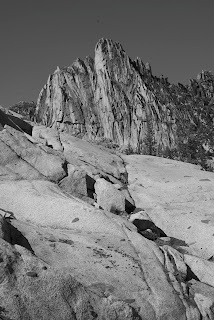 It wasn't really a trail at all, more like a bunch of slabs of granite, some with shallow depressions in them, courtesy of explosives. When you need the help of explosives to get you to your destination, you know you're going somewhere good. 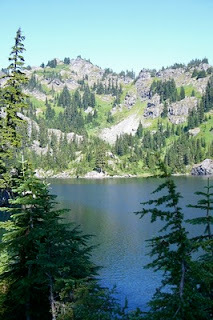 At the first sight of Lake Viviane, I reached for my hanky, so happy I was nearly crying. I'm not going to try to describe it; that's what photos are for. 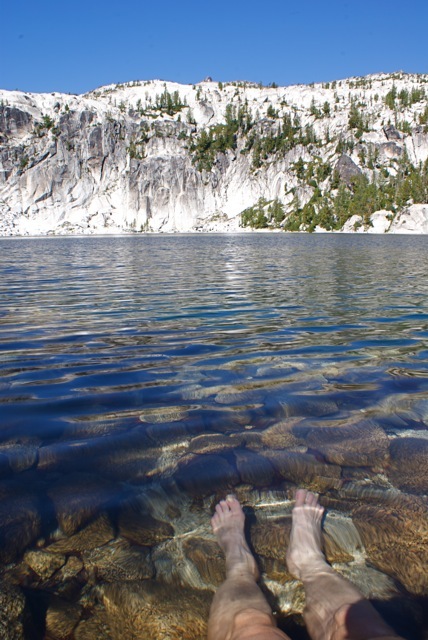 I tried to swim in the lake but it was leg- and mind-numbingly cold. 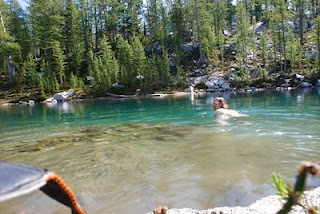 swim in Sprite Lake- yes, that is snow behind me! 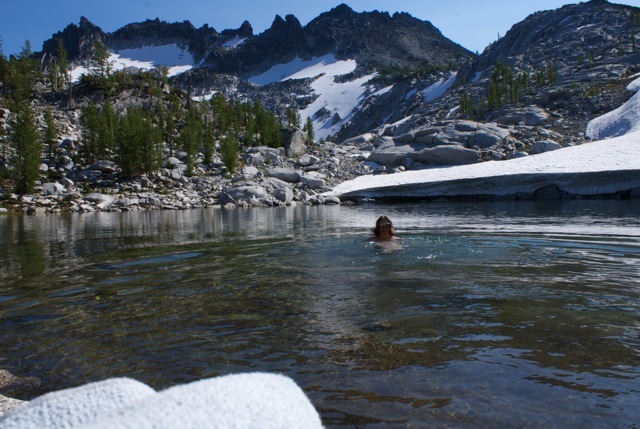 My friend and I had different goals and expectations in the Enchantments. 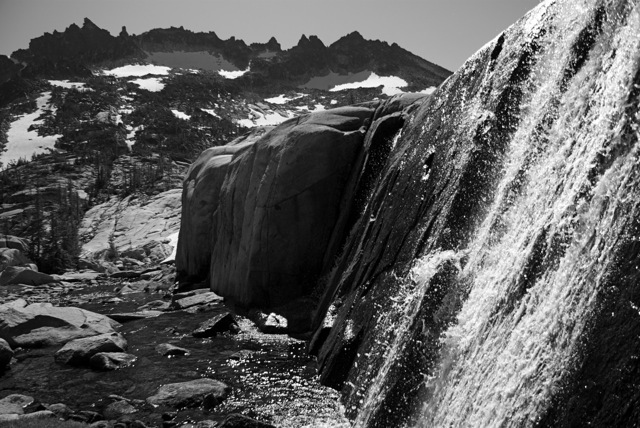 His was to see everything he possibly could; mine was to swim in everything I possibly could. 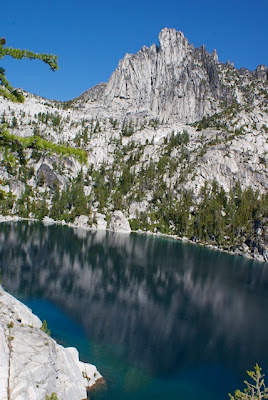 Somehow, we made compromises and I swam in a couple lakes and we still made it up to Prusik Pass. We admired views, photographed, I swam, we wandered and then it was time to head back down. It had taken us over 2 hours to ascend so we guessed we'd arrive in camp just in time for dinner. 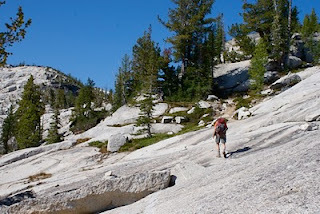 On the trip down, which for me is always much more tricky than the ascent, due to that darn gravity, we talked about weighing the screw-up possibility factor against departing a day early from Snow Lake. In other words, the trip up and around the Basin area had wiped us out so much, we felt to do it another day would increase our risk for an accident or injury. As we were making breakfast the next morning, we saw a rescue helicopter headed to the basin for those who were not so lucky to escape without injury. I took it as a sign that we were doing the right thing. Yes, I had planned this trip for over 6 months and had wanted to go there for over 10 years, but breaking a leg or worse was not my idea of a 10-years-in-the-making trip. As a consolation, I swam in Upper Snow and Nada Lakes on the hike out. 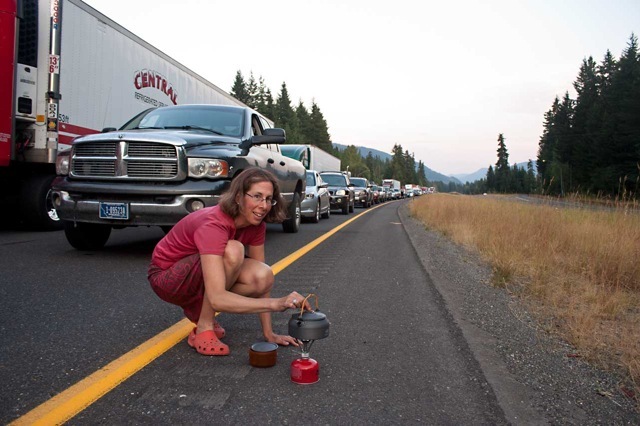 The drive home was not without incident, as a section of I-90 was closed for blasting. It was a party on the freeway... or could have been, since I got out the Pocket Rocket, made some cocoa and heated up dinner, but no one was curious enough to approach us. That weekend, I worked on the Gold Creek Trail with WTA, with the hot sun bearing down on me while I lopped branches of encroaching brush. We had lunch by the creek and, as I dipped my head in, someone remarked that I had a look of bliss on my face. Oh, if he only knew! I pored over my Alpine Lakes Wilderness map to see what lakes I was missing, as far as my swimming was concerned. Somehow, I had let Lake Lillian, on the west side of Rampart Ridge, slip from my radar. Alone on the trail once more, I climbed over downed trees, endured steep climbs and descents, repaired some toppled cairns and made it to the lake at last. 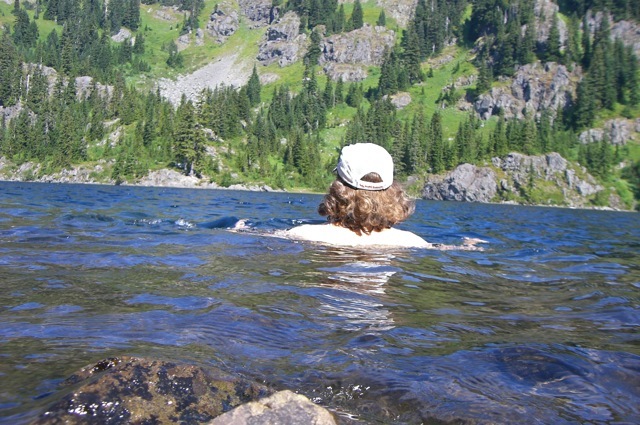 I managed to get in a nice swim and get out before two fishermen arrived, returning along the steep lakeshore from an overnight trip. On my hike out, I stepped over logs, just as before, until I found myself at a dead-end. Unbeknownst to me, I had just stepped over a log that was blocking off the wrong-way trail. I panicked a little, as I had packed lightly for the hike, with the confidence of the Enchantments backpacks still lingering, and I imagined myself having to spend the night there, with no water and a couple of almonds for nourishment. No thanks! That was enough to get me to burn a little stored glycogen and get my brain to think more logically. Soon, I realized my mistake and was on the correct trail down, emergency bivouac averted. Two days later, I departed for the ultimate wilderness... New York City.